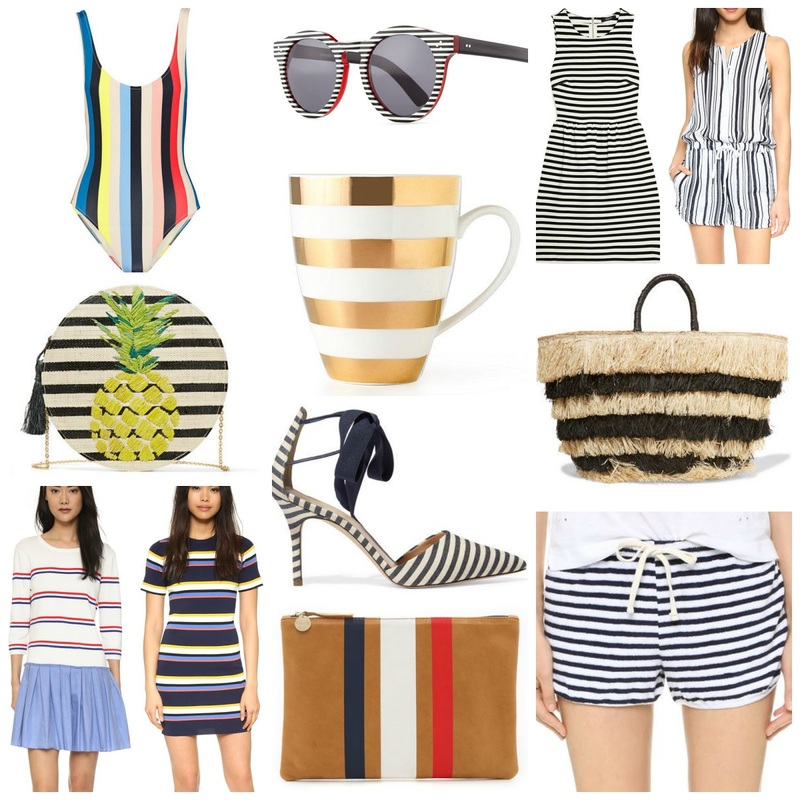 Vertical stripes, horizontal stripes, thick stripes, thin stripes - I love all things striped! I pulled together a fun assortment of clothing, accessories and a mug that would make drinking any hot beverage more fun! 1. Solid and Striped Anne-Marie swimsuit - I don't always gravitate towards a one-piece swimsuit, but the colors in this one really appeal to me. 2. Illesteva Leonard II Striped Sunglasses - Not something I would wear everyday, but I love the look of these striped sunglasses. And the red accent adds the perfect balance of color. 3. Madewell Striped Stretch Dress - I have a similar style dress from Madewell that is a few seasons old and wear it all the time. This new version looks like it would be a closet staple. 4. Stateside Vertical Stripe Romper - I jumped on the romper bandwagon last year (remember this post?) and just picked this one up a few weeks ago. As a stripes lover, I adore this pattern and it looks super comfortable. 5. Kayu Luna Striped Woven Bag - If you can't wear a pineapple purse in the summer, when can you?!!! 6. Aurora Stripe Mug - For some reason, I have been buying up mugs recently. I love to drink hot water (I know, weird but I do) and sometimes tea, but this gold and white striped one seems like it would take my experience up a glamorous notch. 7. Kayu Pinata Fringed Woven Tote - I recently picked up the Kayu tote in the classic straw pattern, though I debated getting this fringed one too. It's not too big and the fringe detail makes it so unique. 8. J.Crew Striped Canvas Pumps - I can see these worn with a flowy white dress or even ripped jeans and a button down blouse. And at a heel height under 4 inches, my feet wouldn't have to suffer. 9. English Factory Combo Dress - I am the primary color queen (remember this post? ), and I was immediately drawn to this cute striped dress with a pleated skirt that is attached! 10. Whistles Striped Knit Tee Dress - This dress has gone out of stock and come back in so many times and I never have been able to snag it! I currently have it sitting in my cart so hopefully I can grab it this time. Though it's a fitted style, I can see it worn with sneakers or flats to dress it down and make it perfect for a casual everyday look. 11. Clare Vivier Supreme Flat Clutch - Clare Vivier's Leopard Clutch is a classic and one of the most worn pieces in my closet, so this striped version seems just as wearable. 12. Sundry Dolphin Shorts - Perfect for the beach, pool or just staying cool in the sweltering summer heat - these shorts are a warm weather must have! Another fun beauty find - Mario Badescu teamed up with Clarisonic to make this amazing set! And it contains one of my favorite cleansing gels - such a great value.